(Nanowerk News) A new method for preparation of a double-layered nanoporous membrane suitable for virus filtration was developed by researchers at Pohang University of Science and Technology in South Korea, in collaboration with the Russell Research Group at University of Massachusetts at Amherst. Purification and concentration of viruses are critical steps in the identification of pathogenic viruses from patients’ samples, the titration of viruses with low titer in patient sera, the in vitro cultivation of viruses, and the observation of viruses after purification. Development of a device to concentrate virus particles from diluted solutions enables the measurement of viral titers in drinking water that will improve public hygiene by the prevention of water-borne viruses. Current microfiltration devices and ultrafiltration membranes have not been very effective for virus filtration since the virus particles permeate into a small number of abnormally largesized pores. A new type of membrane, providing both high selectivity and high flux, is needed to filter viruses. The method developed by the Korean researchers overcomes the difficulty in satisfying both very high selectivity and high flux for the filtration of human rhinovirus type 14 (HRV 14), which is a major pathogen of the common cold in humans. Their membrane is an 80 nm thick film with cylindrical pores of diameter 15 nm with a narrow pore size distribution. This layer is prepared by using a thin film of a mixture of a block copolymer and a homopolymer, and mainly acts as a virus separator. The support layer (ca. 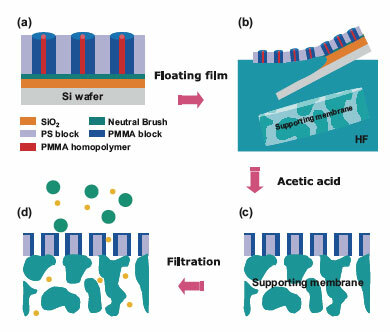 150 µm thick) is a conventional microfiltration membrane with a broad pore size distribution. Professor Jin Kon Kim, who heads the Polymer Nano-Rheology Lab at Pohang University, and the lead author of the study, told Nanowerk about their latest findings: "Since the nanopore size is easily controlled from 10nm to 40nm, this technique could be used for the filtration, purification, and concentration of various viruses." "Filtration of viruses can be applied to the cultivation of human cells for therapeutic purposes using animal sera without risk of infection of zoonotic viruses" Kim says. "Moreover" he adds "it is possible to develop a virus-proof filter for haemodialysis of patients with renal failure who are at great risk of viral infection." 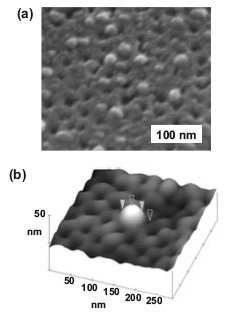 The researchers report their findings titled "Nanoporous Membranes with Ultrahigh Selectivity and Flux for the Filtration of Viruses" in the March issue of Advanced Materials.